Horizon motoryachts releases an Australian sportsyacht: the Horizon E56 XO. The Horizon E56 XO sportsyacht debuts in May 2016. Base price starts from $2million. To attract a share of the popular 50 to 60-foot sportsyacht segment, Horizon Australia has turned to its Taiwanese superyacht parent company to create a new sedan-style model with a big emphasis on celebrating the great outdoors. Horizon Australia said it worked closely with the Horizon Group for more than a year to make the luxurious E56 XO sportsyacht it describes as "perfect" for the Australian market. The design has been developed from Horizon’s E56 flybridge motoryacht which, since its introduction in 2013, has seen more than 20 built and delivered to international clients, including five cruising Australian waters. The new XO model is a result of Horizon incorporating suggestions from customer and dealer feedback. The flybridge of the E56 has been removed to create the sleek profile of the E56 XO, while maintaining a spacious and luxurious vessel but with a fresh interior design and alfresco entertaining areas. The XO has been designed from the waterline up, including a reduced gunwale height to offer the new sleeker look. Among the numerous design features and options are new roof lines with a targa top supporting the radar and satellite domes, a new fishing and barbecue transom module, high-low swimplatform with room for a tender or jetski, and a bow entertainment zone with table, seating and sunbed. 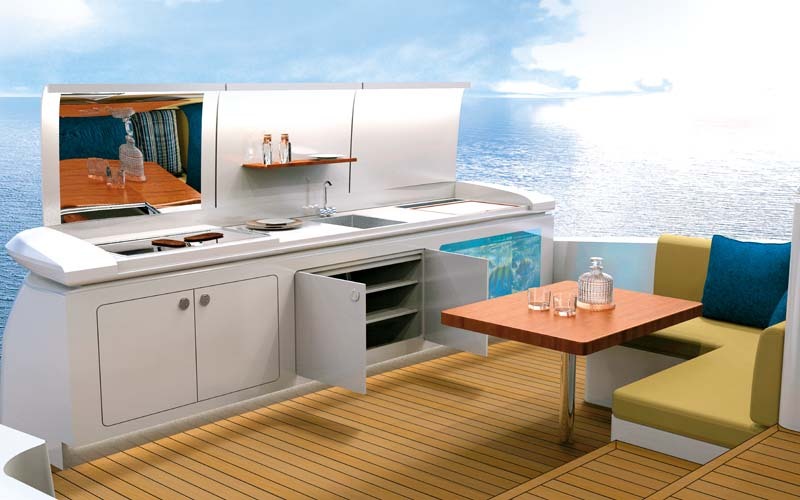 The galley has been moved to the aft of the saloon with a hopper window and sliding door to serve inside and out. For outdoor cooking and/or fishing is the impressive-looking transom module that includes a barbecue, sink, 30kg/day icemaker, livewell, rod lockers and storage. The cockpit also features a cold chest as well as a large dining area and 22in TV. Inside, a high-low 50in TV is matched to a BOSE entertainment system and can be seen from the galley or the U-shaped dinette. The high-low table here transforms the area from dining into a double bed for extra guests. The saloon’s starboard helm has settee seating and a Raymarine package featuring large colour displays, autopilot, chain counter and gauges, plus two CCTV cameras in the engineroom and one at the cockpit. A fishfinder has been fitted in keeping with the outdoors theme of the new model and the boat is also prewired for FLIR, AIS and more. Carried over from the E56 sister ship is the accommodation layout with only minor changes. The forward VIP cabin and head are replicated but the starboard cabin now has two single berths side-by-side instead of crossover bunks. The full-beam master stateroom with king bed has been given a makeover, the head now moved to the starboard side of the entrance and a large robe to port. The XO is powered by economical twin 705hp Caterpillar C12 ACERT marine diesel engines and the hull has been reinforced for future Seakeeper gyro installation. The Horizon E56 XO makes her worldwide debut at the 2016 Sanctuary Cove boat show in May. Contact Erica Rae on (07) 5577 9009 or email erica@hmya.com.au.